The sharp eyed among you may have noticed a banner which appeared at the bottom of this blog a couple of weeks ago. 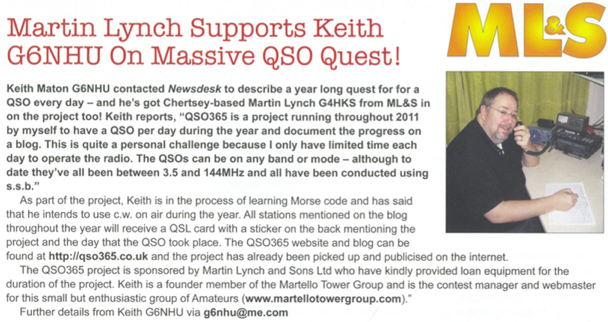 I’m very pleased to announce that QSO365 has been sponsored by Martin Lynch & Sons Ltd. The following article was published in the April 2011 edition of Practical Wireless magazine. Reproduced by kind permission of PW Publishing Ltd.
Martin has loaned me an MFJ-974HB Balanced Line Tuner which will be used when I install a doublet aerial here in the next few weeks which should make a big difference as I’ll be able to get it much higher than my existing long wire and it will be far more efficient. I have decided on a doublet for a few reasons – It’s cheap and simple to build, it’s a balanced aerial which can be fed with very low loss balanced 450 ohm ladderline and when fed through a good balanced line tuner, it should perform well. This entry was posted in Sponsorship and tagged QSO365. Bookmark the permalink.